Tell me how long I can float. Don’t want to sing the song that we wrote together so long ago. 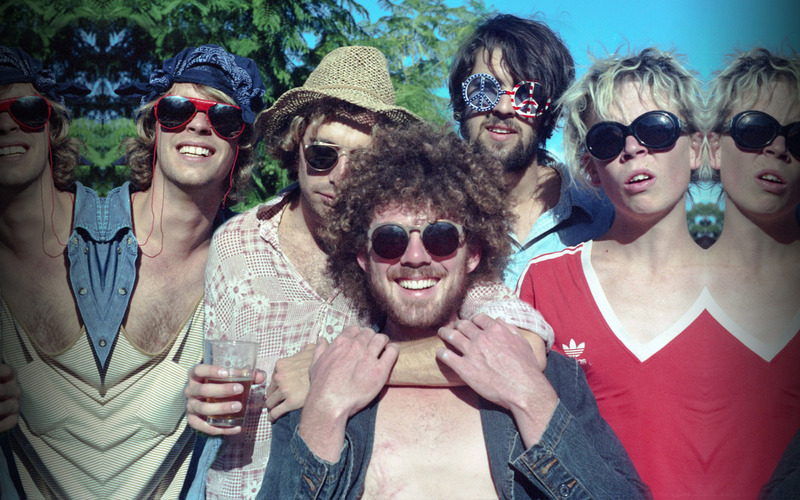 Pond is a collaborative psychedelic rock music group from Perth, Australia founded by core members Nick Allbrook (Vocals, Flutes, Keys), Jay Watson (Guitar, Bass, Keys, Vocals), and Joseph Ryan (Guitar, Bass, Vocals) in 2008. Pond was founded with the idea to have whomever they wished play with them, and Kevin Parker and Jamie Terry round out the current core lineup. Three members of Pond (Allbrook, Watson, and Parker) are also members of the indie rock group Tame Impala. Their first album Psychedelic Mango Vision was released on Modular in 2009 followed the very same year by their second studio album Corridors of Blissterday, a live recorded album completed in merely five days. Their third album Frond was released in 2010 and had a heavy pop influence. The group is currently on tour making stops at such festivals as South by Southwest in support of their 2012 release Beard, Wives, Denim. What, exactly, defines a band as “psychedelic”? It’s a hard thing to put into words, one of those “you know it when you hear it” deals. That’s because psychedelia is a lens through which to view the world, not a world unto itself. To put it another way, it’s a language containing many dialects, and not everyone speaks it the same way—sometimes, not even members of the same band. Take, for instance, Australia’s Tame Impala. Its buzzed-over 2010 debut, Innerspeaker, was “psychedelic” in the Floydian sense of the term, using fuzzy riffs, studio effects and amorphous arrangements to take listeners on a wicked trip, man. Nick Albrook and Jay Watson both play in that band, but on Beard, Wives, Denim, the fourth album from their spinoff project Pond, the lysergic influence is channeled through different musical forebears: Think less Piper at the Gates of Dawn, more dosed Electric Warrior. Bursting out the gate with “Fantastic Explosion in Time,” a song with the title and propulsion of a ‘60s garage rock nugget, the album doesn’t really take off for the cosmos until halfway through the second track, “When It Explodes,” as its hazy strum pauses and a trance-inducing bassline opens up a sky full of guitar echoes and synthesizer chemtrails. Elongated instrumental passages are plentiful, but rarely does the band indulge in song-length stargazing. As the titles of the first two songs suggest, Pond likes things that go boom, and Beard, Wives, Denim has several booming moments: “Moth Wings” stomps like a Zeppelin funk number; “Elegant Design” swivels with soulful sass; and the glammy “You Broke My Cool” sounds like Swedish psyche-revivalists Dungen covering “All the Young Dudes.” Overall, Pond’s definition of psychedelic is much more earthbound: it’s not trying to sound as if it’s sending transmissions from space, only from the farmhouse where the album was recorded. In other words, it’s music for the lower extremities as much as the head.